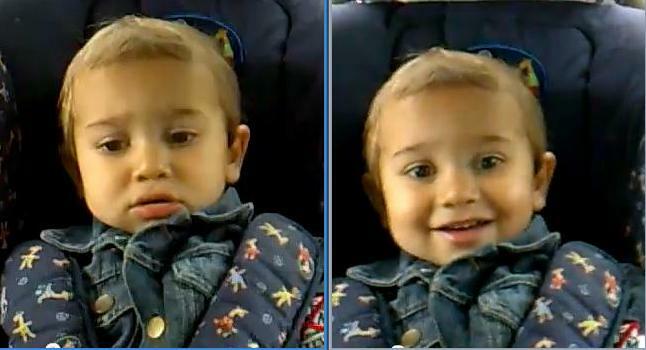 Awesome emotional change when the kid here's the song he likes! Watch the clip here! I know, I know, a lot of you are rolling your eyes after reading this. But come on. Seriously? Most animators in my workshops want to work at Pixar, yet on their hard drives or thumb drives the majority of ripped or downloaded movies are Pixar movies. They've heard my rants many times but I ask again. You want to learn from Pixar teachers. You want to work there. But you don't have $9 to buy the DVD? Don't you want to support the company so that they can continue to make their movies, so that you can one day work there? Sure, that's a simplistic view, but I really don't get it. It's not going to break your bank and you support your peers. You're stealing! I know, I sound like an old fart, but hey. It's so easy nowadays to get things for free but out of all the things, as an animator, wouldn't you at least support the animation industry? But this is not what prompted this post. It was an email from Jamaal Bradley. 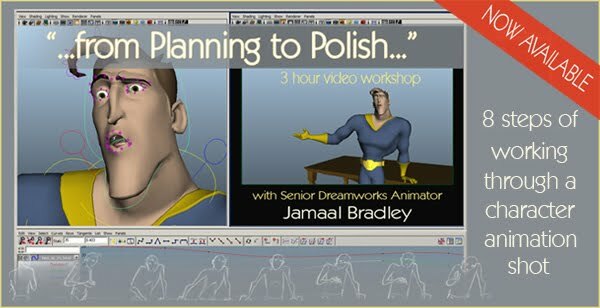 His "From Planning to Polish" tutorial is $29.99 and it's a great tutorial, well worth the money. Yet in his email he explains that people have been passing along the quicktime tutorial, which forces him now to change his ways of delivering his tutorials to people. And that just pissed me off. Seriously? You can't afford to buy something for $29.99? A fellow animator is working hard to produce something in order to help other people. But none of that matters. Just like movies, or music or whatever is easily copied and ripped, why pay for it? I know this is a useless rant, but I still had to rant. Out of all the things, you don't even support your own industry. Animation Mentor - Creatures class01 from aulo licinio on Vimeo. Thanks Alexis for the tip! Moonshine : Artists after dark from alexis wanneroy on Vimeo. DreamWorks first personal art publication, Moonshine, was conceived as an opportunity to highlight the breath of artistic development talent at Dreamworks. This short documentary gives you a sneak peek into the personal works from the artists. Over the Summer I've been downloading and watching awesome animation tutorials and highly recommend them to you. First, you got Jason Ryan's tutorials at jasonryananimation.com (and there a ton of them there). There's a lot more to check out, so don't miss it! Rio - "Samba Parade" Blu Animation from Isaak Fernandez on Vimeo. 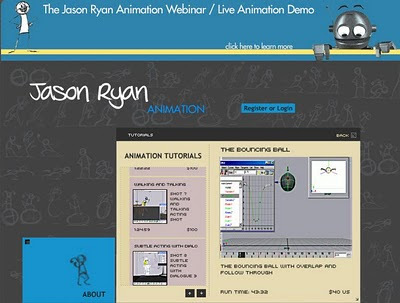 YouAnimator is a place to showcase your demo-reel or short animation! Stop sending your demos to studios to add to their pile of CDs and video tapes. If you are an aspiring animator – eager to be discovered, this is your page. Our goal is to create a central site on which the world’s best character animators can show off their demo reels – and be discovered – may they be in India, Argentina, Norway, Iceland, the US or any place in the world. Our purpose is to help you achieve your dreams as an animator actor: to be discovered as a character animator. Here you can create your own portfolio page – and send its URL to friends and collegues and companies. 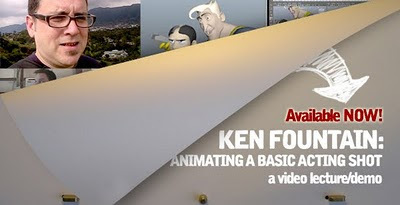 YouAnimator is also a site where you can learn from each other and each other’s work. There is a LEARNING menu button that will take you to the SWEATBOX – page. The Sweatbox is where your work-in-progress can be critiqued by others. And we’ll give you some tools to practice your trade. We’ve uploaded a few animatable character rigs (under DOWNLOAD) that you can use to create short animations with. 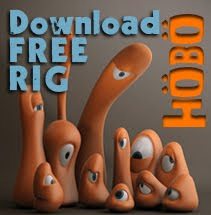 They also offer two rigs and multiple sets for download! This looks so good! Gameplay footage at the 3:12 mark (trailer at the beginning of the clip). Besides the general awesomeness, I love the head movements! The Norman parts cracked me up!! Simon Irvine August 2011 Animation Reel from Simon Irvine on Vimeo. If you head over to reelbarrow.com you get a list of tons of awesome animation reels you can check out. Thomas BECKER - Demoreel 2011 - Animation (creatures) from Thomas BECKER on Vimeo. Enid from Leanne Towers on Vimeo. Great site with lots of tutorials (via onanimation) and a free rig! 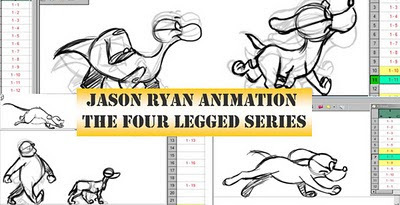 Head over to animationscout.tv, the TV part is very important. Don't go to animationscout.com. Just sayin'. Head over here for the list. Definitely acting out the words, but the timing and ideas are funny! Thanks Le Roy for the tip! Watch all the clips here. Always so good! Embedding not allowed, so follow this link.
. Pixar Animation Internship reel . from Louaye Moulayess on Vimeo.
. additional pixar shots . from Louaye Moulayess on Vimeo. Huge library of sound clips! Awesome! Head over to soundboard.com! Cracked me up! Love the music and sound too, nice work! Sheeped Away - a short but educative making of from Junaid Chundrigar on Vimeo. For more info visit the official site and the facebook page. Thanks Seppe (animatie.blog.nl) for the tip!